With the recent publication by the National Research Council on early childhood mathematics, I thought I’d post a little summary with some thoughts of my own. I have always had interest in education policy, curriculum development, and ways to close the educational gap in the United States and around the world. I believe even the smallest steps can lead to vast improvements, and the general idea is awareness then action, fueled by collaboration. Make the problems fully known and understandable, and then provide mechanisms through which those problems can be addressed at the individual, family, community, local/town, state, regional, national, and international levels. I have particular interest in mathematics, science, and technology education and hope to stay involved in this realm for my entire life. Since it is quite high on today’s national policy agenda, hopefully action will be expedited to show progress domestically. Then in fixing our national education system, we can serve as a good example to developing nations in how to structure early education and community programs to maximize intellectual growth. Click here for a Science Daily article about the report. 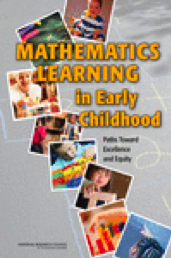 Math education must start at the earliest possible age. A coordinated national early childhood mathematics initiative should be put in place to improve mathematics teaching and learning, particularly for ages 3 to 6. Mathematical process goals should be integrated in other content areas. Math should not be a stand-alone subject but should be a part of the curriculum for history, english, art, music, and other subjects/classes. We must improve the technical and scientific literacy of the general public. This should be done by promoting “number comfort” from early education through adolescence and making math and science education a family, real life, and every day thing. There need to be revised professional development initiatives for educators reflecting science/technical/mathematical curriculum needs. Early childhood education partnerships should be formed between family and community programs to work together in promoting children’s mathematics. These highlights offer just a glimpse of what is in the comprehensive report, which includes full-scale curriculum, professional development, and implementation recommendations. In my own point of view, I think there needs to be some sort of accreditation program for mathematics and statistics education, covering preschool, elementary school, middle school, and high school (truly, high school is a different story, but certainly some aspects by which the Pre-8 schools might be evaluated are applicable to grades 9-12 as well). A stepwise and gradated approach to evaluation of statistical/mathematical initiatives should help schools work from their current status to a desired and achievable one. I am aware of accreditation programs that do currently exist at the state and regional levels (although it seems as though most are for a school as a whole and not individual subject areas). On the contrary, I am unaware of the steps these types of evaluation programs take to ensure that systematic inequalities don’t impact evaluation results. Subject-level evaluation programs should not reward schools but rather provide valuable feedback and awareness for all types of early education programs. It should provide a framework for schools to understand their relative status, in conjunction with possible areas for improvement, on a local, national and international level. Administration/Management – Quantitative methods should be made operational in the management and evaluation of educators within the school system. It not only promotes understanding of such methods, but is also an engine for measurable results, positive reinforcement, professional development, and recognition. In some sense, schools are run like a business that should employ quantitative methods to ensure profitable return, an optimized allocation of resources, and quality control. Employ the DIS cycle and school administration will certainly find it easier to know what works, and what does not. Culture/Community – As stated in the NRC report, partnerships must be formed between the student, school, family, and local community. Evaluation should occur on how well a school takes steps to forge and maintain these relationships. How much do children hear about math in school as opposed to out of school? Curriculum – The most obvious one involves evaluation of the process by which a school teaches math and statistics. Does the school sustain its process equally over time? Do educators use a wide array of techniques to teach mathematical concepts? In the end, something needs to be done and the NRC report is the right first step towards awareness. With the use of some simple quantitative methods and collective brainpower, we can take action to decrease inefficiencies and close the national and international education gaps in mathematics and science, and in turn, many other subjects… Use data to evaluate, support, and improve! A great site to help get your child reading early by a certified reading specialist and veteran teacher.